The August 2014 State of Oregon Economic Indicators is now available here. Special thanks to KeyBank for their generous support of this project. The Oregon Measure of Economic Activity slipped in August while the three-month moving average, which smooths month-to-month volatility in the measure, stood at -0.08. “Zero” for this measure indicates the average growth rate over the 1990-present period. Weaker employment data in comparison with earlier this year is weighing on the measure in recent months. Manufacturing employment continues to grow at a healthy pace and most components within the sector continue to support the measure. The construction sector contribution was negative, attributable to softer residential building permits and falling employment. Note that construction employment appears to be running contrary to general economic trends and may be revised upward in later months. The labor force contributed positively again, a hopeful sign that a strengthening economy is luring workers back into the labor force and may reflect a faster pace of migration into the state. A string of steady gains in the University of Oregon Index of Economic Indicators was interrupted by a 0.5% decline in August. Most components deteriorated somewhat during the month. Initial unemployment claims, which had fallen to very low levels the previous month, edged up but still remain well within a range generally consistent with solid job growth. Note that occasional declines in either indicator are not uncommon during expansions. 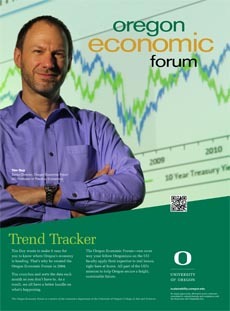 The two indicators suggest continued growth in Oregon at an average to somewhat above average pace of activity. Further gains are likely as the national economy will continue its general upward trajectory for the foreseeable future.